The holidays are upon us. The holiday season is simultaneously the happiest and most stressful season of the year. Between grocery shopping, cooking, and having family over it’s easy to see how stressful the holidays can be. You may believe there is just too much to plan and so many people to keep happy. 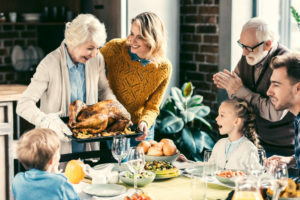 If you are worried about this holiday season as Thanksgiving approaches, here are some tips to help you manage your stress this November. The most effective way to avoid surprises and stressors is to get organized and make a plan. Come up with a menu for Thanksgiving dinner. To make it fun you can even have your kids and partner help you plan it out. Having a plan reduces your stress because you aren’t scrambling around at the last minute to make something. Once you have planned your menu, make a list of what you need. Plan a day to knock out getting all the items on your list. Once you have your supplies, plan your cooking schedule. Cooking some Thanksgiving food ahead of time can greatly reduce the amount of preparation you have to do come Thanksgiving Day. Don’t hesitate to ask for help. Remember Thanksgiving is a family holiday meaning it’s okay, in fact, encouraged, for everyone to contribute. Assign dishes to different family members, make it more fun by making it a cooking contest, the best dish wins the Turkey wishbone! If you can’t do it all, don’t be ashamed to pick up a dish or two from your local freezer. Remember the most important thing is enjoying this day with your loved ones, not making everything “perfect”. Remember what the holidays are about. This is a time to spend quality time with your family and loved ones. A time to be thankful and cherish who you’re making the Thanksgiving spread for. Try to not let making the “perfect” Thanksgiving dinner distracts you from the reason why you do it. While the holidays are a time to give, don’t forget to take the time to receive. There is beauty surrounding you, the changing of the leaves, the warmth of the family room fire, the joy of being together, take all of this in, receive what you are being offered in the beauty that comes with the holiday season. If the stress of the holidays is taking a toll on you, take a break. Taking time for you is important. Getting ready and preparing for such big holidays can lead to mindless tasks and acts so stay mindful and take a break from the work to enjoy yourself and your time. If you find yourself overwhelmed by holiday stress and feel you can’t confide to a loved one or friend, stress management counseling in Dallas may be the solution that you need. Life, for the most part, is stressful, but there are ways you can cope with it. Lifeworks is a highly trusted and recommended Dallas counseling center. We can help those suffering from addiction, depression, anxiety, and those who just need the tools for stress management. If you have questions or would like to schedule a consultation, please contact us today.